This must be Red Bull week! Earlier this week I spotted my first Red Bull logo appearance, not only once, but three times in two days. Well, this must be Red Bull week because I spotted a Red Bull logo again tonight in a place I’ve never seen it. At our local grocery store, Food4Less, right by the registers. My husband swears the Red Bull POP display (Point-Of-Purchase) has been there for a little while. As for me, this is the very first time I’ve noticed it. Quite appropriate for a week already full of Red Bull. 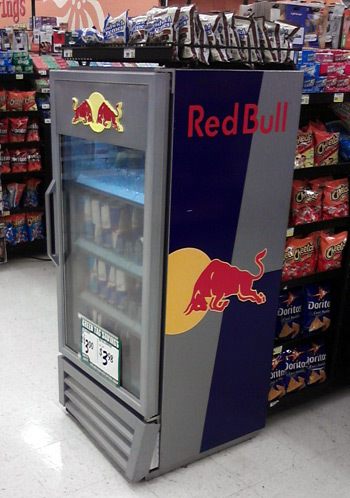 How often do you see Red Bull in your daily life? Previous Post Did you know there’s a cow on your roof?